When I began writing Examined Lives about how my mother came to have a lobotomy by Walter Freeman and the ramifications for my own life, I did not know what I would find. I had of course known my mother before she had her lobotomy (I was almost seven at the time) and afterwards. I did not, however, have any idea of what she was like before my birth. She rarely mentioned that period of her life. So, discovering this was one of the surprises of my family research. I found a mother I had never known. On coming to Chicago on her 20th birthday, she found her excitement. The first thing she and the friends who accompanied her did was take a speedboat ride on the Chicago River and the next day she got a job waitressing at a party for the prize fighter Jack Dempsey. It was the beginning of her rise in the hospitality industry. She took up residence and worked in the area around North Michigan, then as now a bustling, swanky place to be. She started out as a waitress at the lunch counter of the Walgreen’s Drug Store at Rush and Oak, which served breakfast, lunch and dinner and offered for dinner as drinks of choice domestic Port, Sherry or Muscatel Wine as well as fruit juice and chilled tomato juice. This store served sometimes over a 1000 patrons a day. She soon became its night manager, then moved on to become the head receptionist at the Younkers Café on East Chicago where she managed 12 waitresses, including Ruth “a sad piece of humanity who was a streetwalker on the side.” Finally, she reached what she considered the pinnacle as room captain at the Camelia Room of the Drake Hotel frequented by the likes of Clark Gable and Greta Garbo. Outside of work she enjoyed Chicago to the full, taking art classes at the American Academy of Art, having a bit part in a production of Richard Sheridan’s “School for Scandal,” and attending concerts and plays starring John Barrymore and Lillian Gish. With various swains and friends, she took in the night clubs. In just one night she visited the Dome of the Sherman, Rickett’s, Ye Old Cellar, Old Heidelburg, Adolfo’s, Augustino’s and the Blue Star. One evening she and a date spied an empty baby carriage in an apartment hall. They stole it, she got in and her date pushed her down Rush Street. It was wonderful to meet this woman, my mother, who I had known as caring and kind, but not very sophisticated or interested in things like poetry. Given what was to happen to her later in life, I am grateful that she had this period in which to shine. It makes the lobotomy, however, all that much more dreadful and unwarranted. Nevertheless, the saddest surprise for me in my research was the poem I found among my father’s possessions, clearly revealing his loss of love for my mother fairly early in their marriage, even before my birth. It is a much worked over scrawl but with the beginning words clearly “I could adore her/but I abhor her.” That discovery hit me in the stomach and eventually went on to explain much. 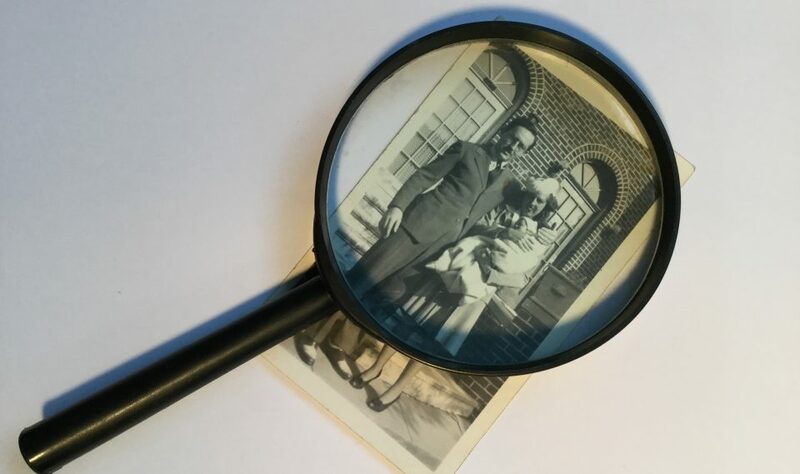 As the time comes ever nearer for the publication of Examined Lives, I am still trying to understand the man who performed a lobotomy on my mother. I never met Walter Freeman, the man who was the very public face of lobotomies as cures for mental illness in the mid-20thcentury and at whose own reckoning performed some 3,500 such operations. The photo below of his performing a lobotomy, without mask or gloves, in front of curious bystanders was one of his publicity stunts. The procedure he used extensively, as depicted, involved hammering an ice pick-like device through the eye socket and wiggling it back and forth to severe connections between the frontal lobes and the rest of the brain. Freeman performed that operation on my mother in 1950. He saw her for the first time on a Friday, pronounced her a paranoid schizophrenic, and did the procedure the following Monday. The man wasted no time. After the lobotomy, her drive and “sparkle,” as my aunt put it, was taken from her and in fact she ended up being “adjudged insane” and institutionalized for a period of time. What led to her having the lobotomy? That is the story I tell in my book Examined Lives, based on thousands of pages of family letters, diaries, scrapbooks, medical records, an unpublished novel, poetry, and photographs. And, yes of course, on the writings of Walter Freeman.